by Baggini, Julian; Fosl, Peter S.
Peter Fosi is Professor of Philosophy at Transylvania University in Lexington, Kentucky. Julian Baggini (www.julianbaggini.com) is a freelance writer and co-founding editor of The Philosophers' Magazine. This is a great textbook. It gives you snippets of information about various tools employed by philosophers. Everything is explained very clearly, referencing the relevant concepts after each explanation, great textbook recommendations, even some great online references. This one does just about everything right. 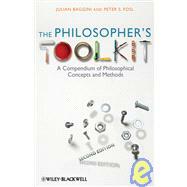 The Philosopher's Toolkit A Compendium of Philosophical Concepts and Methods: 5 out of 5 stars based on 1 user reviews.